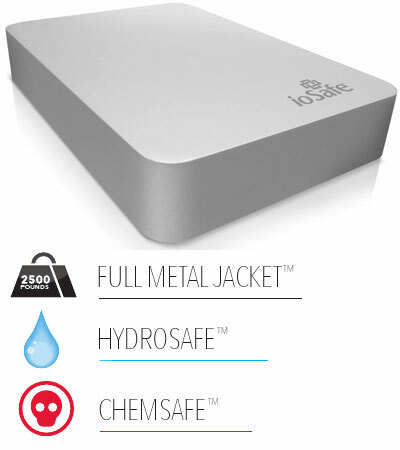 The company ioSafe produces ultra tough disaster proof data storage devices. One of their coolest products is the ioSafe Rugged Portable + DRS(Data Recovery System) Its minimalist look alone is pretty awesome but there is nothing minimal about this portable storage unit. It can hold up to 1TB of data, that's 1 Terabyte, 1000 gigabytes, or the storage 15.6 top of the line iPads. Is it tough? It's made of about 1 pound of billet-machined Aluminum and 1.5 pounds of titanium. The aluminum components of the ioSafe Rugged Portable can resist 2500 pounds of pressure and the titanium components 5000 pounds. Is it water proof? It can be submerged in 30 feet of water and not affected for 3 days. Did you drop it in your private jet's gas tank? No problem this data safe can be submerged in jet fuel, diesel fuel, and various oils. We are not sure why you would want to unless you were hiding it from Jason Statham or something... but he would still probably find it. Is there a warranty? ioSafe also offers in our opinion one of the best warranties in the consumer data storage industry on the Rugged Portable DRS. It's a 1 year no questions asked, no hassle replacement, and up to $5000 which can go towards a third party forensic recovery service if necessary for recovering your data.